This year saw Darius launch his new project Moxy Muzik, which is both a record label (vinyl & digital) & party concept, which sees Darius play long extended sets in small intimate clubs. The labels launch saw the first release sell out on vinyl & require a repress & the digital going straight in at number one on Beatport´s minimal deep tech genre. Dance of the Shaman, the first release by Darius, was also supported by the likes of pioneers such as Derrick May on his boiler room, Laurent Garnier & many more. He wears his passion for the music on every part of his existence, as only people who do it for the love of the music are able to. Having seen every fad and trend come and then quickly go in the electronic scene, yet never having wavered from his devotion to the groove, it’s with plenty of conviction that Darius’ huge musical knowledge and vast vinyl collection allows him a unique versatility. A DJ in the truest sense, whether that be abyss-deep house, or Detroit techno, the groove will always be there, unwavering as the emblem of his style. If his ethos is noteworthy, Darius’ achievements are just as distinguished. 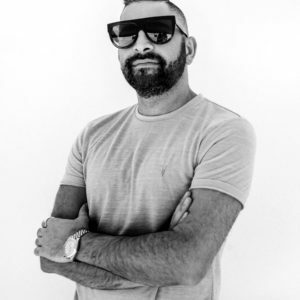 He has toured the world as a DJ and has ticked off every major club and festival in an extensive touring schedule; taking in all continents.